This week’s group of 43 vehicles that have been added to the roster for Forza Motorsport 5 on the Xbox One is highlighted by a trio of 2013 model year vehicles and our first 2014 model year vehicle. 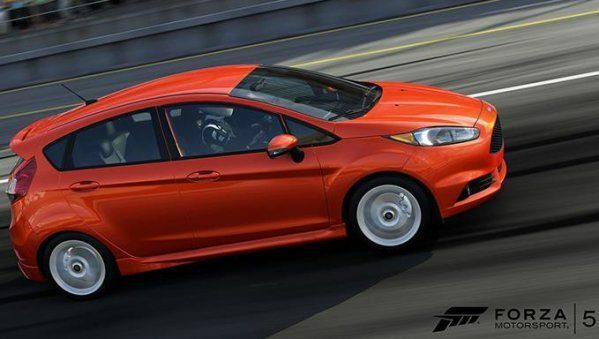 The 2013 Ariel Atom 500 V8, the 20013 Mazda MX-5 and the 2013 Audi RS7 are the latest batch of very-new vehicles to officially be announced for Forza 5 while the new Ford Fiesta ST (5-door model like the one sold here in the US, shown above) is the first vehicle from the 2014 model year. Also included in the newest list of Forza 5 additions are some of my favorites like the 2010 Abarth 500 Esseesse, three different BMW M3s, four Corvettes (still not including the new Stingray), four F-bodies (two Firebirds, two Camaros), the Ferrari F40 and F50 and the 2008 Dodge Viper SRT10 ACR that is still one of the fastest cars to ever lap the famed Nürburgring in Germany. With this latest and larger group of vehicles added to the virtual dealership roster of Forza Motorsport 5, the list of revealed vehicles that we can be guaranteed to see when the game arrived on November 22nd has grown to include 173 cars, trucks and sport utility vehicles. Of course, with well over 600 vehicles included on Forza Motorsport 4 and three weeks remaining until both Forza 5 and Xbox One debut, we can expect to see a couple more long vehicle addition lists in the coming weeks – and like some vehicles that are left to be a surprise for gamers to discover on their own late next month. Stay tuned to TorqueNews for continuing coverage of Forza Motorsport 5 news including impressions from the game when it debuts later in November.